When you are married to a band director, and when it’s autumn, you will always feel like you have more free time than your spouse, no matter what you do for a living. Marching band season puts high demands on my man’s time. Today was hubs’ first completely band-free weekend in months–MONTHS I SAY!! !– so we had major plans. And I had a major surprise! 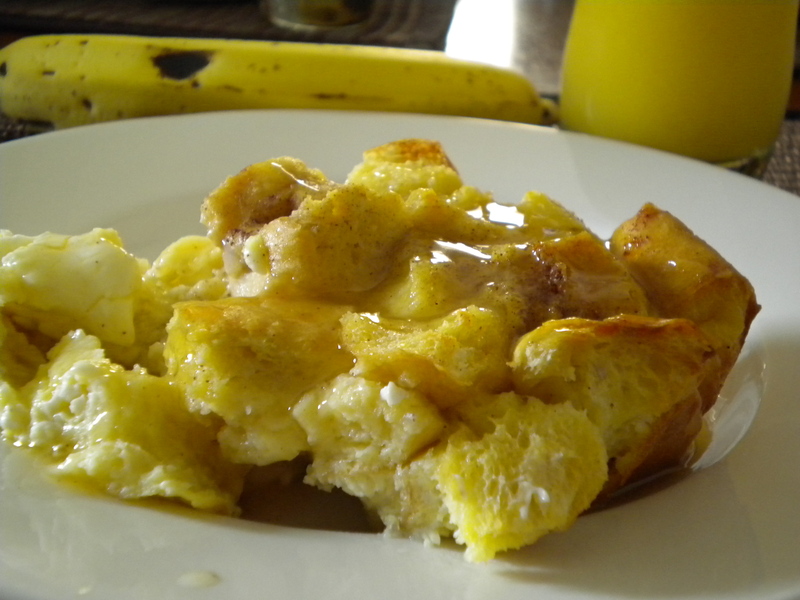 My plan was to fix my hubbsy a delicious make-ahead breakfast so we could laze around a little longer in the morning. The breakfast you’re about to check out is simply mahhhhvelous, dahhhling. 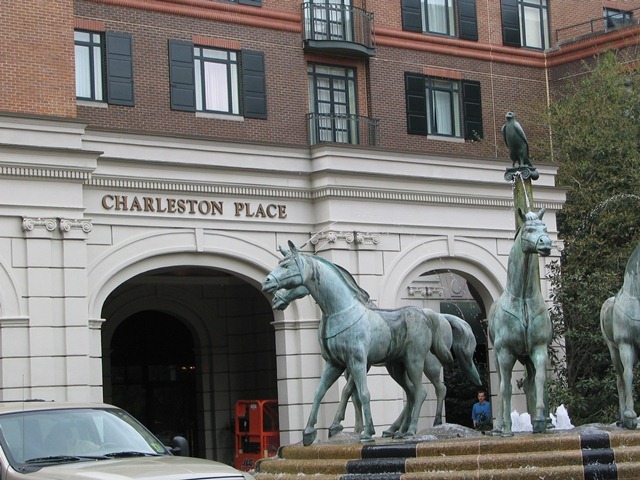 It comes from Charleston, South Carolina, or inasmuch inspired. 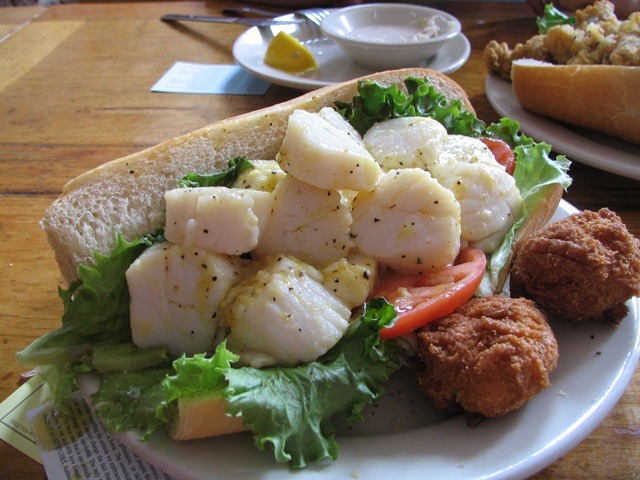 At the Cafe Cafe, you will eat the one of the most delectable breakfasts you can get in the South. 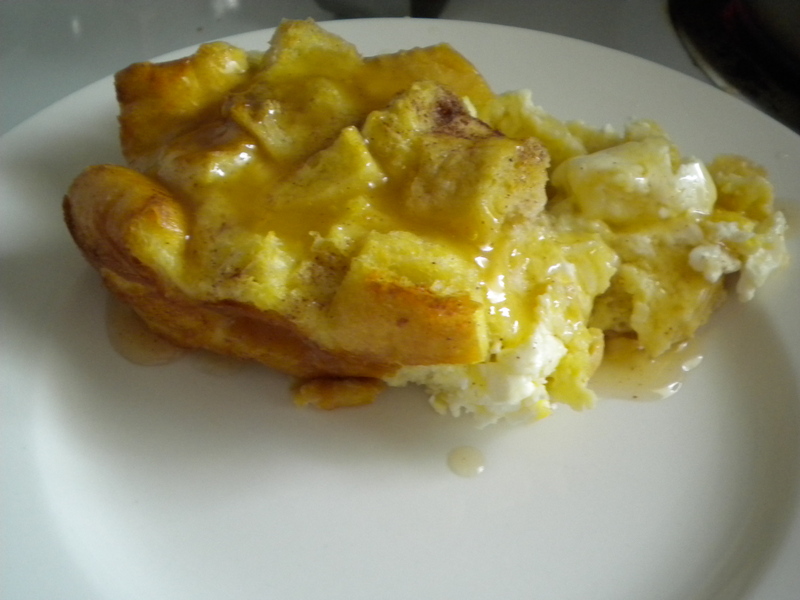 Eating this strata is like eating custardy bread pudding for breakfast–rich and heavenly. This is serious, syrupy Southern goodness. Even though it’s a French-toast base, well, the French ain’t got nothin‘ on the South. I swear my house smelled like Thanksgiving or Christmas morning while this was baking. And then it tasted like Thanksgiving or Christmas morning in my mouth. And then the hubs thus loved the breakfast lazy surprise and therefore declared we will eat this again on the following occasions: 1. when we have special overnight/out-of-town guests 2. when it’s a holiday 3. when we are snowed in and 4. when we have friends over for our next brunchy double-date. A word to the hungry: you can make this up to 24 hours ahead of time, or in as little as 2 hours ahead of time. Another word to the hungry: this is quite rich. I mean it’s right up there with Bill Gates rich. Hope Diamond rich. 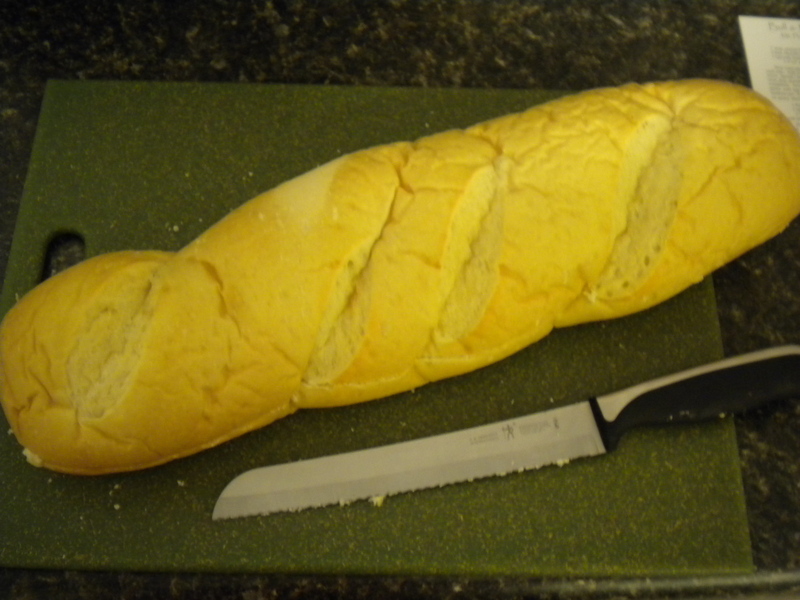 2–Chop up a loaf of French bread into 1-inch cubes, (they can be a little bigger and nothing will get hurt, promise) Put half of the cubes in the pan. 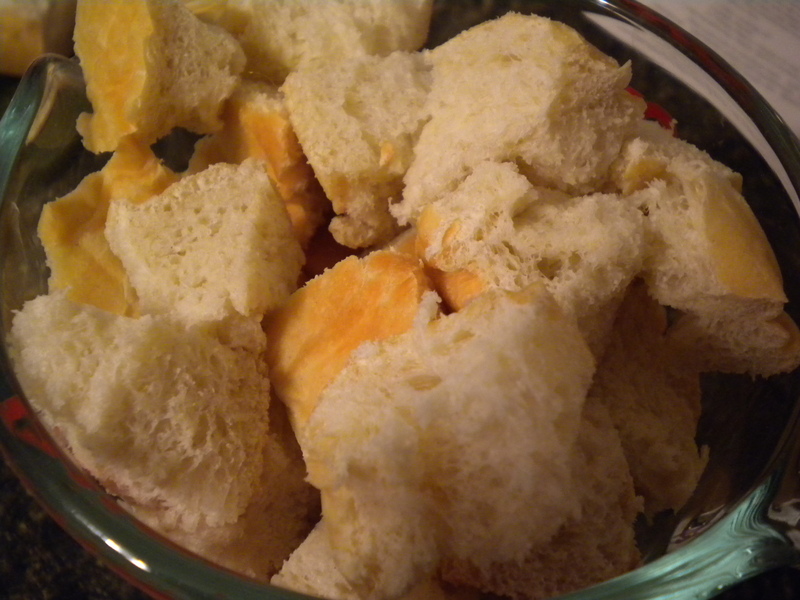 3–Dice up 1 package of cream cheese (8 oz of Philly’ll do ya good) and sprinkle amidst the French bread cubes. Cover the cheese with the rest of of the bread. Sprinkle the whole mess with 1-2 tsp. cinnamon (depending on your taste). You could most definitely do a fat-free, or reduced fat version if you are watching calories—but what the heck are you doing reading through this recipe if you are watching calories? Hmmmmm? 5–Smush the mixture down with a spatula so everything gets all good and soaky and then cover with plastic wrap until ready to bake! 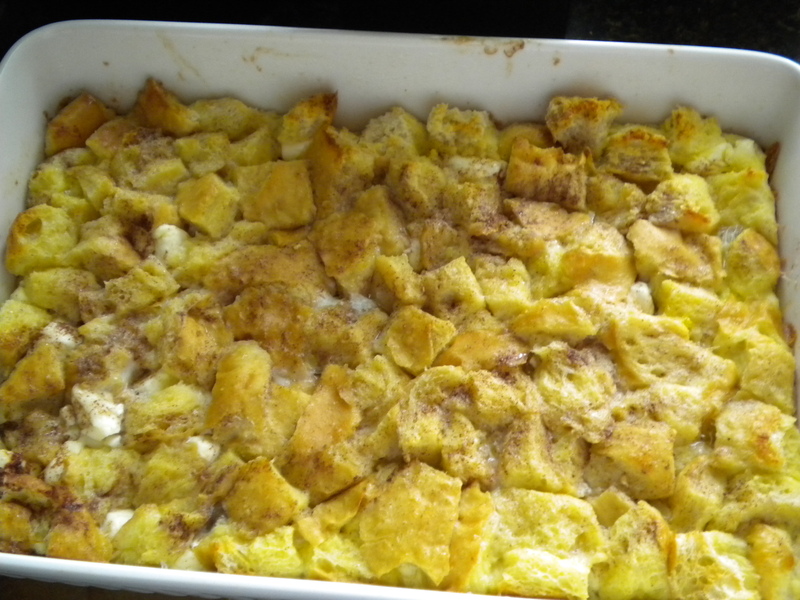 6–In a 350 degree oven, bake the strata, uncovered for 35-40 minutes or until golden, puffy, gotta-get-your-fork-ready. Let sit for 10 minutes before serving and voila! Get your apple cider syrup and eat this up. 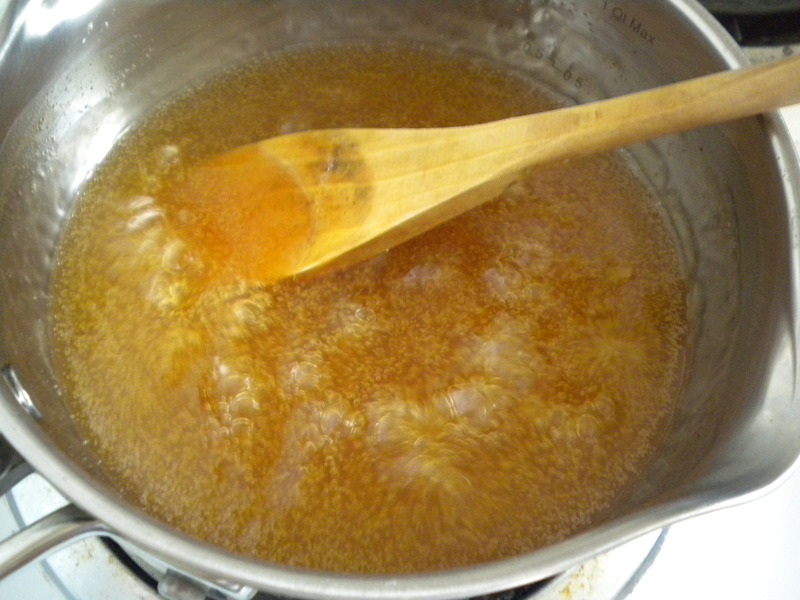 1–Combine 1/2 cup sugar, 1/2 tsp. cinnamon, and 4 tsp. cornstarch in your small saucepan. 2–Stir in 1 cup apple juice, 1 T. lemon juice and cook and stir over medium heat until thick and bubbly! When it gets thick and bubbly, cook it for at max 2 more minutes. 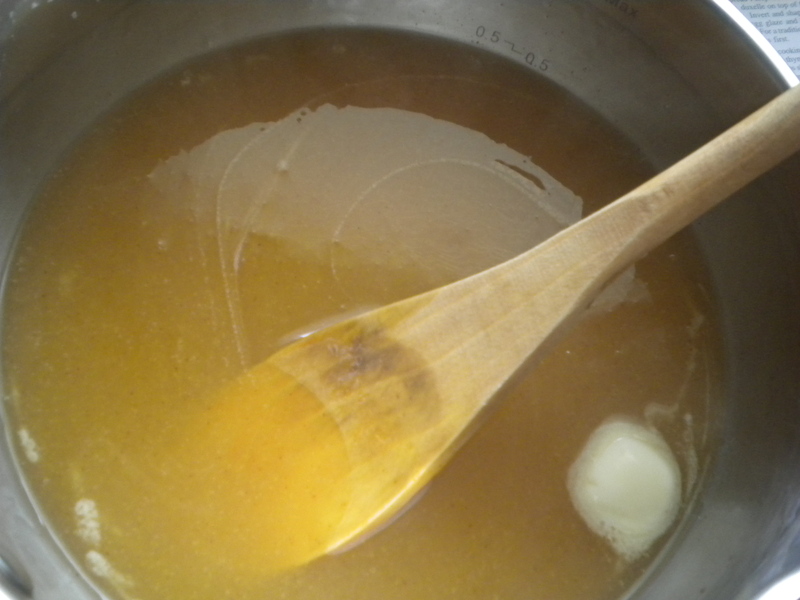 3–Off heat, add 2 T. butter and stir in. Yeah. Like I said, hope diamond rich, but well worth an extra lap or two in the pool. You’re welcome!!! I’m glad you liked it. Yes, the syrup is to die for! Next Next post: perfect man food.